Kalamazoo, MI - also in Florida, Georgia, Indiana, Tennessee, and the last 16 years in Colorado- where I have just purchased a home in Edwards. Guiding professionally in the Vail area since 2011. I was taught to fly fish at at 10 years old by my father Scott, and have traveled across North America from Alaska to the Caribbean in search of fish on the fly over the past 20+ years. Last year I chased big Steelhead in British Columbia, Tarpon in the Keys, Permit in Mexico- twice, Bonefish in the Caribbean, and already have a few more trips planned for this fall. This past April I was lucky enough to spend 10 days across 10 rivers in central Montana- certainly a new yearly tradition and a wish fulfilled. I will always wish to return to the Bulkley River Lodge in northern British Columbia on the Skeena river system- by far and away the best fishing trip of my life. Swinging for Steelhead is a life changer. Final wish this year- Roosterfish on fly - on foot - on the Baja Peninsula. 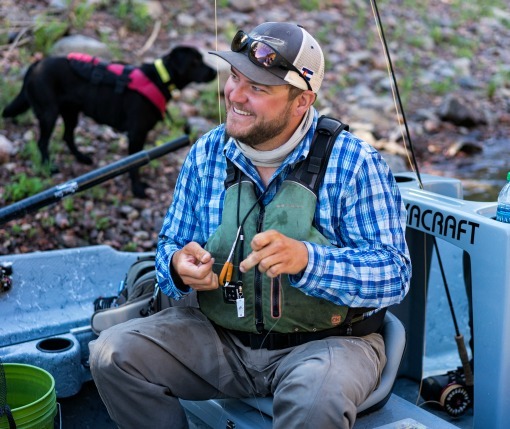 Snowboarding, Travel, and of course, fly fishing everything. thanks for three great days on the Eagle River! My first winter trip was outstanding! Thanks for all of your coaching and tips.